Which computer programming language is best for kids? Many parents have questions about selecting the best coding language for kids to learn. In this article, we will review the best kids programming languages that are perfect for beginners. 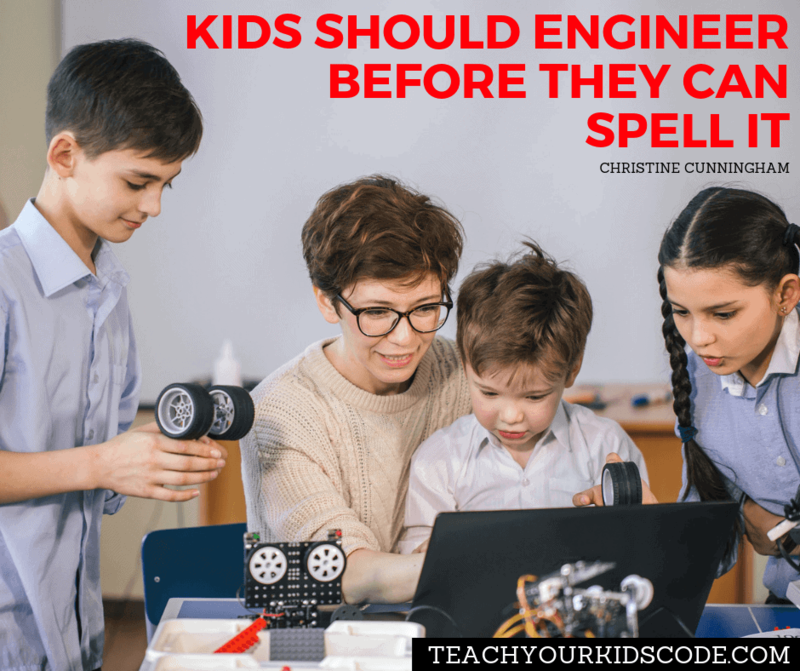 There are some guidelines to consider but the reality is that choosing the best kids coding language for your child will vary depending on your kid’s interests and coding abilities. Teaching coding for kids doesn’t have to be a difficult and ‘boring’ task, we have lots of ideas on how to make coding fun! 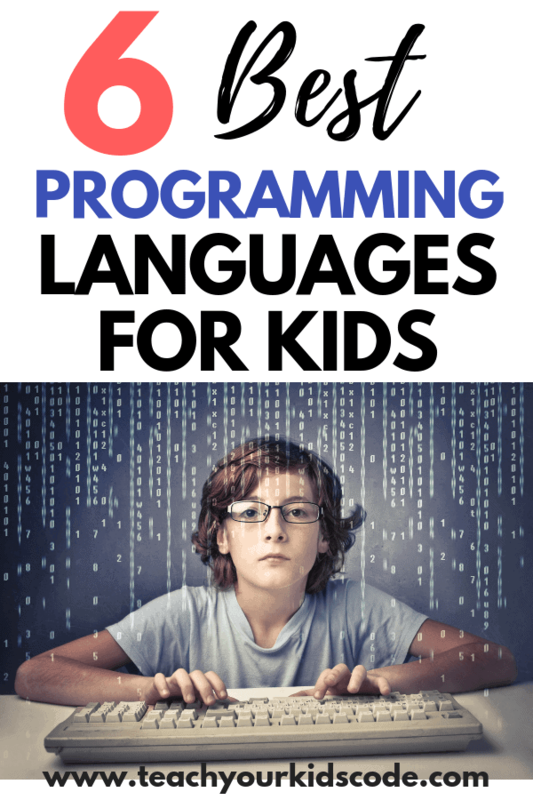 Read below to learn the pros and cons of a variety of programming languages for kids. Programming for kids: Which programming language should we start with? Which kids programming language should you choose? One of the first decisions to consider when choosing a kids programming language is whether to go with a visual block-based coding language or a text-based language. For younger children, especially those who are not yet reading well, a block-based coding language is likely best. Visual block based coding languages are great for children 5-8 years old because they require very little reading, are brightly colored, and are engaging for younger children. One of the most popular block based kids coding languages is Scratch (more on this later). At roughly nine years old kids are ready to start learning basic text based code languages. Text coding is a very detail oriented task that requires a lot of concentration and focus. It’s similar to old school christmas lights. One misplaced semicolon in a sentence of code or one loose christmas light in a string and the whole tree goes out. For that reason, it may be difficult and boring for young kids because it’s not as animated and fun as block coding. Debugging is a major part of coding that is pivotal to more advanced programming languages. Older teenagers at 13 years old will be ready to learn more advanced coding languages and can start to build real projects and programs. It’s never to early to begin learning the basics of coding! Computer coding languages allow programmers to give very specific instructions to a computer in a language the computer understands. Each coding language has a syntax, which is the set of rules, like spelling or grammar, for that particular program. The more fluently a programmer speaks a code language the more likely their projects will run smoothly and accomplish the goal they’re seeking. Many parents want their children to learn to code so they are better prepared for futures in computer science but also because coding teaches young people a variety of soft skills like problem solving, creativity, and resilience. Ultimately, parents should pick the language that your child is most interested in because they are more likely to commit and be consistent with the language. Consistency will ultimately lead them to build upon their skill sets and help them progress with their coding education. Allocating even 30 minutes of code based learning a day is the perfect way to get kids started with consistency in coding. By using block based coding and gamified learning, your kids will be excited about learning code and won’t feel like they’re doing extra work. Once they’ve advanced beyond block based coding they can learn text coding which leads to being able to develop apps, software, and web-based applications. Scratch is a programming language designed specifically for educational purposes and developed by the MIT media lab. It was created to be user- friendly and for any age group. It’s designed to be fun and very visually stimulating with bright colors which makes it ideally suited for children learning to code. Scratch is also easy to learn because you don’t have to type any complicated code to get it to work. It uses “blocks” that perform a function to teach children how to solve problems, think creatively, work as a team, and build computational learning skills through a series of trial and error projects. Scratch uses characters they call “Sprites”. Players use “functions” to create a “script” that animates the Sprites. The functions control what the Sprite looks like, how they move, what sounds they make and various advanced functions that students can build upon as they progress through the program. As students learn how the functions and scripts work they’re able to play games where multiple sprites work together. One of the best parts about Scratch is that it’s an online community where students can connect with people from all over the world to share games, stories, and collaborate on projects. The community allows students to learn from each other without the aid of a formal instructor. Scratch can work well for pre-readers with help from an adult. Scratch is also great for adults who are learning the basics. Scratch is visually compelling and will keep children engaged. Scratch has a wide variety of games, challenges, and functions for kids to engage with. Scratch is available on windows, apple, and linux. Scratch does not actually teach line by line code. Usually, programming is text-based but Scratch is done on a visual format. While this makes it easier for children to learn how algorithms work on a theoretical level, but it does not teach an actual coding language. Scratch it is also is very different than the code an adult would use to say – create an app. Scratch is not available in a mobile app. While there is a lighter version available called Scratch Jr. It is not the same program but an even simpler version designed for kids age 5-7. The social network component may be a bit inappropriate for some very young users. Take a look at some of the starter projects offered on the Scratch website and choose one to get started! 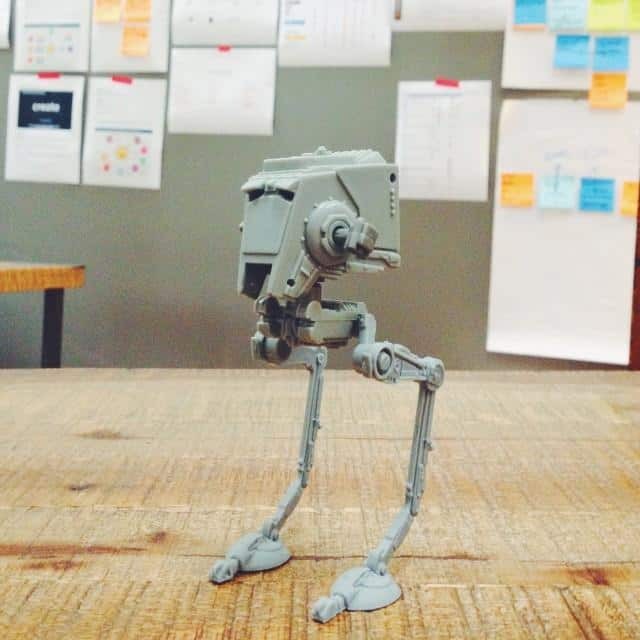 If your child loves Star Wars, check out these Star Wars projects you can make in scratch! Blockly is Google’s more advanced version of a block-based coding language. Blockly is similar to scratch in that they both use visual blocks in place of manually coding but they’re different because Blockly is designed for a slightly older audience with more advanced skills. Blockly and Scratch have recently teamed up to create scratch blocks, which is a nice amalgamation of both interfaces. The interface is clean and user friendly. Blockly translates blocks to text based code in several different languages which allows user to see the subtle differences between various languages. Blockly has been used by a variety of developers to create games and apps that kids will enjoy. Blockly is a learning language that isn’t very diverse in it’s uses. Blockly is done on a visual format. While this makes it easier for children to learn how algorithms work on a theoretical level, but it does not teach an actual coding language. Code.org uses Blockly in its courses and projects aimed at younger children. One of the most popular is the Frozen challenge for hour of code. Harry Potter lovers will love to use their own magical harry potter wand to code spells with the Kano Harry Potter Coding wand. This device uses a programming language based on Blockly. You can read my full review here and check out prices for the coding wand here. Dash and Dot is a popular robotic toy to help kids learn code. This robot is very popular in classrooms as there are loads of classroom activities and lessons available for teachers online. You can read my full review of all the best coding robot toys for kids here. For the latest prices of the Dash and Dot robot, check out Amazon. If you want something simple and easy, check out the Blockly games available on your web browser. These simple coding games are easy for kids to follow and understand and take very little preparation to get started! Swift is Apple’s programming language that is used to create iOS programs for iPad and iPhone. For brand new coders there’s Swift Playgrounds which is an iPad app which is a gamified learning program that teaches young people to use Swift through puzzles. Apple has even gone as far as offering comprehensive Everyone Can Code curriculum with lesson plans and teachers guides to help parents facilitate their kid’s coding education. Once young people develop beyond Playgrounds they can learn to code through project based platforms that will help them develop their own apps. Swift is best used with students 8 years of age and older. While Swift is a great language to learn, it does have its limits though because it’s a language that can only be used for iOS. Playgrounds is fun, userfriendly, and easy for a variety of ages. Swift is only used by Apple for iOS development which is limiting. Swift Playgrounds only works on the iPad. Java is easy to learn, whether you’re brand new at coding, or interested in learning an additional new language. Java is one of the most popular and most well-liked coding languages in the world and is used for over 3 billion mobile games, apps, and web based applications. If your kids love Minecraft, Java is likely the best language to start with as Java is the language of Minecraft. Kids can actually learn to code by creating their own ‘minecraft mods’ with Java. With it’s English-like syntax Java is easily read by the naked eye and quick to learn. It’s the most in demand coding language for hiring managers and is guaranteed to be a skill that will land young developers a lucrative job. Java is nearly 25 years old and has a long history of resources and successful programmers. Basically any question that you may have has already been answered in a public forum which makes it easy to source answers to problems and to connect with other Java developers. Java is a text based language so it’s suitable for older kids 8-10 years and older but it is much easier to navigate than C++. Java is simple and easy to learn, write, and debug. Java is also platform independent and can be used from one system to another. Python is one of the best coding languages for kids who progress past the block coding stage. Many coding languages geared for kids are languages designed to teach children the theoretical skills behind coding rather than the actual text based code languages adults use to build apps, software, and websites. Some kids can get frustrated or lost in some of the textbook learning to necessary to memorize the syntax before getting into practical code upfront with other coding languages. Python’s syntax is concise and easily to learn. It minimizes the frustrating parts of coding and gets to the fun bits early on in the learning process. Plus, coding in python is easily readable and similar to the way humans speak which make it ideally suited for kids learning to take the next step in their coding journey beyond gamified block coding. Python is best suited for kids 8 years old and above who have advanced beyond more basic coding games. Kids can easily pick up Python skills to be used in animation and developing games in just a few weeks with practice and consistency. Python is already installed on Mac computers and is easily downloadable in a three step process on other devices. Python has been around for 30 years and has a wide variety of tutorials, shortcuts, and forums for basically any problem you can imagine. Learning Python requires regular and consistent practice. Python is not supported by iOS and Android but can be used in mobile projects with additional effort. Start with our free tutorial on learning python for kids here. Older kids may benefit from an online course for Python beginners at CodeAcademy. Consider purchasing a book of Python games and projects for you and your kids to practice building your skills in Python. While C++ is one of the more complex and time consuming code languages to learn, the results will pay off in spades because it forces students to dig deep and build a solid theoretical foundation in code that can be applied to other languages in the future. C++ is a great language for teenagers and young adults who would like a career in the gaming industry or those who would like to take their understanding of code to a deeper level. C++ is a compiled coding language which means the code has to be written before it is put into another program to work. One of the downsides to compiled languages is that they have to be done correctly without errors before the program will run or they will fail and the coder will have to go back to the drawing board. C++ requires a large amount of syntax textbook learning before practical coding can even begin. Students tackling C++ should be prepared to learn to test, debug, and problem solve thoroughly. C++ has a large library of resources to answer questions and help workshop problems. Any kind of program can be created with C++ from the really basic to super advanced. C++ is similar to other programming languages and makes it easier to learn other languages. These are some of the best programming languages for kids to learn. If your kids are not quite ready for programming languages, we have lots of ideas on how to get started with coding for kids. Check out our Ultimate Guide to Coding for Kids.